Quality data is the foundation of successful financial services, and next-generation technologies like AI and machine learning cannot function effectively without it. The next great challenge for data management teams is to achieve data quality that successfully aligns with business objectives, driving technologies and other capabilities that contribute to the bottom line. FIMA partnered with the WBR Insights research team to complete a comprehensive survey for our upcoming report, Aligning Quality Initiatives with Future Investments in Data Management. Together, we benchmarked the successful application of new investments to discover how data quality contributes to business initiatives. We also asked data management leaders across financial services to share their strategies for driving business value in the future. Most survey respondents are at management, director, head, or VP levels (77%) and have data management teams of 25 or fewer (58%). Another 18% of organizations have data management teams of 26 to 100 members; 17% of respondents have teams of 500 or more. 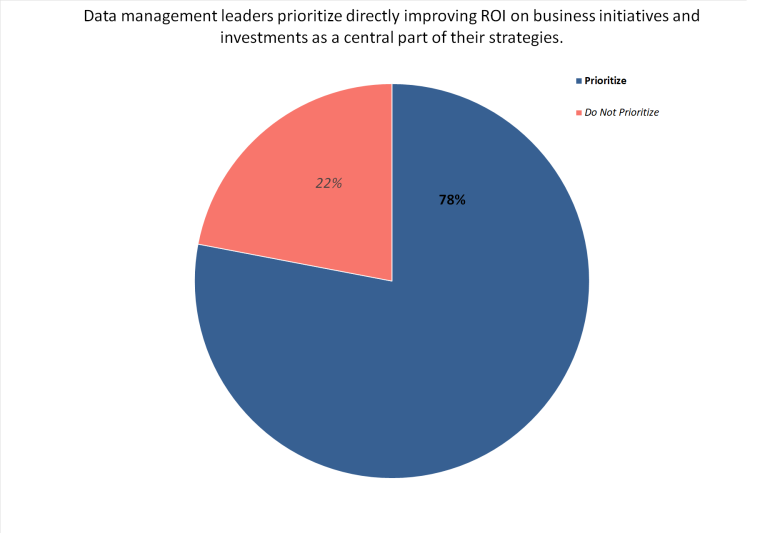 Our first major finding was that directly improving ROI on business initiatives and investments is a central part of data management strategy for the vast majority of organizations (78%). For example, when asked to share the key factors that contribute to the high quality of her data, one VP, Data Management identified: "Alignment with our business partners in terms of the levels of quality expected for retail clients [and a] strong partnership with business partners during [the] data/project implementation phase." Those who rate their data quality in these ways shared their greatest contributors to those shortcomings. 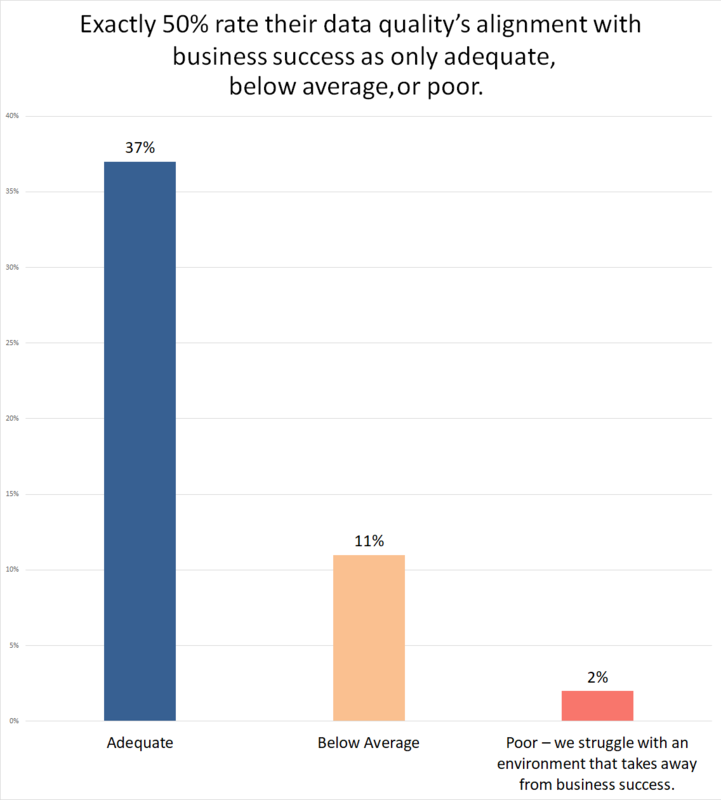 Their reasons include a lack of ability to pull data in a manner that can benefit a broad range of customer needs, complications associated with too many differing systems--they "aren't talking to each other consistently"--data gaps, and a lack of proper training, among others. We can infer that, among the 50% of data management leaders that rate their data quality's alignment in this way, many nonetheless prioritize improving ROI as a central part of their strategies. In other words, they are falling short of their goals. As a result, many data teams are reprioritizing their technologies in terms of business enablement. 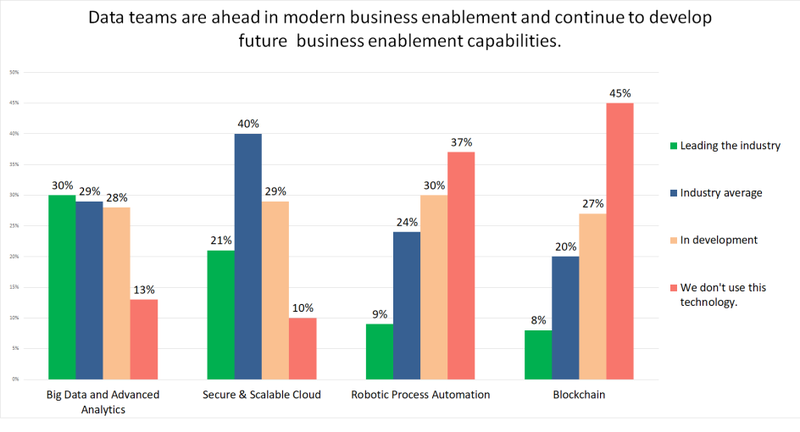 For the purpose of this article, our researchers categorized both Big Data & Advanced Analytics and Secure & Scalable Cloud technologies as 'modern business enablement' tools; they categorized both robotic process automation (RPA) and blockchain as 'advanced business enablement tools' to highlight differences in data teams' utilization of these technologies. The results indicate that the vast majority of data teams are leveraging data for modern business enablement technologies--30% are leading the industry in big data and analytics, and 21% are leading the industry in secure and scalable cloud. Meanwhile, most organizations are either not utilizing or developing data capabilities for advanced business enablement technologies. Thirty-seven percent are not using RPA while 30% are developing data capabilities for RPA; 45% are not using blockchain, while 27% are developing data capabilities. Less than 10% claim they are leading the industry, in each case. "In order to offer high business standards, procurement of data should be secured and collected data reliable in nature. Only when the data is useful, we are able to create strategies and present viable solutions to clients for better business prospects." Even as data teams take early steps towards aligning data management with business initiatives, others are recording great successes in cybersecurity, educating and empowering users to leverage data, and better aligning data with business strategy and growth. Be sure to access the full report on November 20, 2018, here on the FIMA US 2019 event website in the content downloads section to learn more.